1860 Norie Nautical Map of the Cape of Good Hope and False Bay, South Africa. WE SELL ONLY ORIGINAL ANTIQUE MAPS - NOT REPRODUCTIONS. Title: A Chart of False Bay Surveyed by Order of Rear Admiral Stopford, Commander in Chief at the Cape of Good Hope, by P. Description: A remarkable and very rare 1860 British commercial nautical chart of False Bay and the Cape of Good Hope, South Africa, issued by John William Norie. Cartographically, this map is based upon surveys ordered by Sir Robert Stopford during his time as Commander-in-Chief of the Cape of Good Hope Station (1810 âÃÃ¬ 1827). The chart covers from Robben Islands south to the Cape of Good Hope and False Cape, including Rocky Bank. False Bay and the Promontory of the Cape are illustrated in full. In the vicinity of Cape Town, the map offers exceptional inland detail, identifying numerous private estates, by the name of their owners, along the various rivers between Table Bay and False Bay. An inset of Simon's Bay appears in the upper right, near the title area, with important buildings identified. 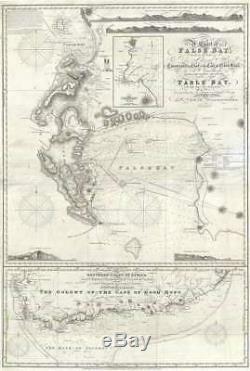 Beneath the main chart of False Bay, there is a secondary map of the Cape Colony extending from the Cape District in the west to Cape Morgan and the Sandy Point or'First Point of Natal. This map offers limited inland cartography including major mountains, roads, and riverways. Some town are noted, among the De Beer Valley, Somerset, various forts,'Gaikas Residence,' Zwellendam, Worchester, Setllenbosch, Caledon, and more. Throughout both maps there are detailed depth soundings, curious annotations relating both maritime and other information. Nighttime sailing directions into Table Bay appear in the upper left. There is an illustration of the lighthouse at Green Point. The map is further embellished by four land profiles. Norie originally issued this chart in 1832. The present example offers updates to 1860 and so must have been issued posthumously by Norie's heirs. Evidence suggests that there were most certainly intermediary variants published, but nevertheless this is the only example of this chart we have been able to positively identify in any collection public or private. Size: Printed area measures 39 inches high by 26 inches wide. If your address is a P. DHL International EXPRESS (45 USD). We can use your Federal Express Account. Duty varies by country and we cannot predict the amount you will be charged. Antique Map Restoration: Geographicus can repair and restore your antique map. Services include deacidification cleaning flattening and backing. The item "1860 Norie Nautical Map of the Cape of Good Hope and False Bay, South Africa" is in sale since Friday, November 23, 2018. This item is in the category "Antiques\Maps, Atlases & Globes\Africa Maps". The seller is "geographicusmaps" and is located in 11221.